What Day Of The Week Is July 28? 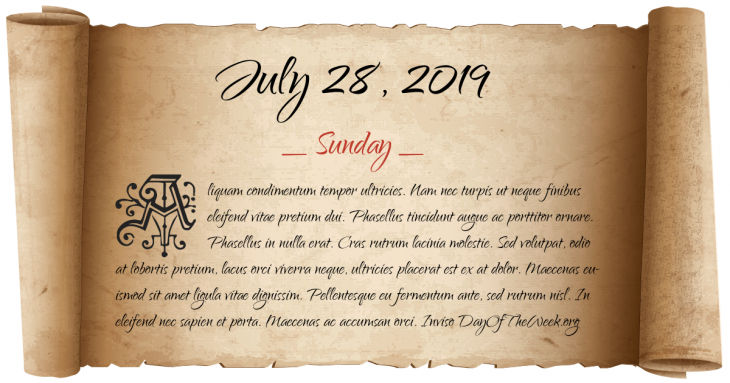 July 28, 2019 is the 209th day of the year 2019 in the Gregorian calendar. There are 156 days remaining until the end of the year. The day of the week is Sunday. Troops of the Republic of Pisa and of the Republic of Florence clash in the Battle of Cascina. World War I: Austria-Hungary declares war on Serbia after Serbia rejects the conditions of an ultimatum sent by Austria on July 23 following the assassination of Archduke Francis Ferdinand. Diplomatic relations between the Soviet Union and Spain are established. World War II: Soviet leader Joseph Stalin issues Order No. 227 in response to alarming German advances into the Soviet Union. Under the order all those who retreat or otherwise leave their positions without orders to do so are to be immediately executed. World War II: Operation Gomorrah – The British bomb Hamburg causing a firestorm that kills 42,000 German civilians. Summer Jam at Watkins Glen: 600,000 people attend a rock festival at the Watkins Glen International Raceway. The Tangshan earthquake measuring between 7.8 and 8.2 moment magnitude flattens Tangshan in the People’s Republic of China, killing 242,769 and injuring 164,851. The historic Grand Pier in Weston-super-Mare burns down for the second time in 80 years. Who were born on July 28?